Address: 1094 Budapest, Liliom u. 44. 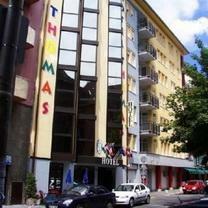 Hotel Thomas is located in the heart of the city. This nice and modern hotel is easy to reach from the highways and from the airport. It's next to the metro, tram and bus lines. Some of the rooms are equipped with special shower cabin with computerized steam bath, foot massage equipment and solarium. The hotel is located in the heart of the city. The hotel is easy to reach from the highways and also the airport (18 km.). Near the hotel there are stations of underground (line 3), tram and buses.